Okay, so this is definitely not us nor anyone we know, but apparently there is a whole middle aged cycling thing going on around the world. What? Well. A new documentary reportedly explains it all: MAMIL: Middle Aged Men In Lycra. If you know someone, or are someone, and you want to check this documentary film out on February 21, 2018 (you know, just to make yourself feel superior) then click here for a complete listing. For the official word on the film, please follow the jump. Worth Western mountain bikers rejoice. Thanks to the efforts of the Quick n’ Dirty crew the legendary Sagebrush Safari (XC and new Super D) in Campo, California is back. The 26 mile XC course is as challenging as it is scenic and will be a complete test of your fitness and abilities. Of course, we’ll have categories for all ages and abilities and even a 18 mile race course for those seeking a little less of a challenge. . . The Super D course has all the lumps and bumps you need with some solid pedaly parts thrown in for good measure. In total, it’s a it’s a weekend you won’t want to miss and promises to be one of the best races anywhere this season. It all goes down March 24 -25, 2018. With XC on Saturday and Super D on Sunday. Camping is available onsite. This is one of the coolest “real” mountain bike race courses on the West Coast and includes little of everything for every body. For all the official details, including how to register, click here or follow the jump. It’s only 101 days until the start of 2018’s first grand tour, the Giro d’Italia, and this year, the race is starting in Israel. Yes, that Israel. And to celebrate the county was “bathed in pink light” on January 22, 2018. The Giro d’Italia will make history this year. Starting with three stages of the race in Israel, it will be the first time that one of cycling’s three Grand Tour races (Giro d’Italia, Tour de France, Vuelta a Espana) has ever been held outside Europe. . . 176 of the world’s top cyclists will begin the race on May 4 against the backdrop of Jerusalem’s Old City. Over the following two days, the competitors will ride from the North of Israel to the tip of the Red Sea, taking in breath-taking views from start to finish. . . 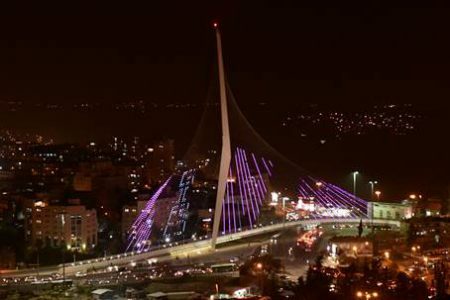 The world’s top cyclists will ride through cities including Jerusalem, Haifa, Zichron Ya’akov, Caesarea, Petach Tikva, Tel Aviv, Beer Sheva, Mitzpe Ramon and Eilat. The Giro will finish three weeks later in Rome, rather than its usual end point in Milan. Israel is one of the most beautiful countries in the world and what a great reason to visit. For the official word, please follow the jump. 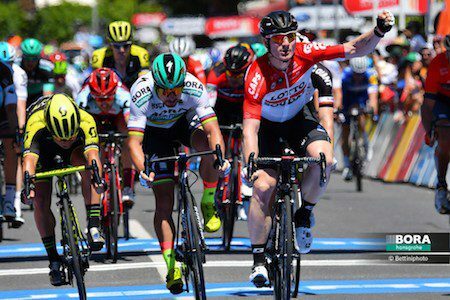 For 135km of the 145km first stage of the Tour Down Under, the breakaway took centre stage, leading the peloton from the start of the day. The peloton wasn’t to be denied though, and timing the catch to perfection, BORA-hansgrohe’s time trial specialist, Maciej Bodnar, was instrumental in driving the pace hard to make sure the predicted sprint finish in Lyndoch took place. Fighting hard for position and picking off his rivals, UCI World Champion, Peter Sagan, took third, behind André Greipel and Caleb Ewan coming from ten riders back and narrowly missing the win. Follow the jump for all the official details from BORA-hansgrohe.